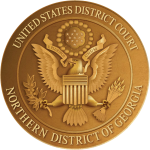 Transcripts of proceedings taken by official and contract court reporters before the U.S. District and Magistrate Judges in the Northern District of Georgia are filed with the court in electronic format. This notice conveys the policies governing public electronic access to official transcripts and the procedures for counsel to request redaction from the transcript of specific personal data identifiers pursuant to Judicial Conference policy before the transcript is made electronically available to the general public. The Judicial Conference policy and amendments to the Appellate, Bankruptcy and Criminal Rules require that certain "personal identifier" information be redacted from court filings. The personal identifiers that must be redacted are Social Security numbers, names of minor children, financial account numbers, birth dates and, in criminal cases, home addresses. Please read this policy carefully. This policy applies to all transcripts of proceedings, or parts of proceedings, filed on or after July 1, 2008, regardless of when the proceeding took place. Once a transcript is purchased through the court reporter by a party or attorney, it will be electronically filed in CM/ECF and the court reporter will notify the Clerk's Office to enable remote electronic access to the official transcript for the purchasing attorney(s) through the court's CM/ECF system. The transcript will also be available for viewing by the public at the Clerk's Office public terminal. Transcripts may not be copied or reproduced by the Clerk's Office for an initial period of 90 days from the date the transcript is filed to allow for the review and redaction of personal identifiers within the transcript. During the initial 90 day period, individuals wishing to purchase a copy of the transcript must do so directly through the court reporter. Concurrent with the filing of an official transcript, an electronic Notice of Filing of Official Transcript will be served on all parties in the case. Counsel are strongly urged to share this notice with all clients so that an informed decision may be made regarding the inclusion of certain materials. The responsibility for redacting personal identifiers rests solely with counsel and the parties. Sentencing transcripts must be reviewed by both defense counsel and the government. The Clerk and court reporter will not review transcripts for compliance with this rule. If there are no redactions to be made, at the end of the initial 90 day period restrictions on electronic public access and reproduction of the transcript will be removed, and the transcript will be available remotely through PACER to view, download or print. Standard PACER fees will apply. Copies of the transcript may also be obtained through the Clerk's Office for a fee. If redactions are required, counsel must electronically file a Request for Redaction within 21 calendar days of the file date of the official transcript. All redaction requests must also be served on the court reporter by U.S. mail or hand delivery. If a party fails to timely request redaction, or to obtain an extension of time to do so, the transcript will be made electronically available, without redaction, 90 days after the transcript file date. If a party files a Request for Redaction, the transcript will not be made remotely available to the public through PACER until the redactions have been made. A copy of the official transcript will be available for review in the Clerk's Office or purchase from the Court Reporter during the initial 90 day period. Home addresses -> Use only the city and state. If a party wishes to redact information other than the listed personal identifiers, that party must move the Court for further redaction by separate motion served on all of the parties and the court reporter within the 21 day notice period. Counsel, including standby counsel, appointed pursuant to the Criminal Justice Act may claim compensation at the applicable rate for the time spent reviewing the transcript, and preparing any redaction request, as well as for costs associated with obtaining a copy of the transcript.